On Sunday our area got hit by a series of really big storms. Just as one ended (and before the next began) the boys and I were driving home from Hastings. As we were driving, Roger said that he saw a rainbow out his window. I couldn't see it but a couple of minutes later, I looked up at the sky and saw one right in front of me. Looking from side to side, I realized that we were seeing something pretty rare..at least for me..we could see the full arc of the rainbow..from where it met the ground on the left to where it met the ground on the right. I managed to pull over and snap this picture with my camera phone. I was so disappointed that I hadn't thought to have my regular camera in the van with me. This picture doesn't do it justice. 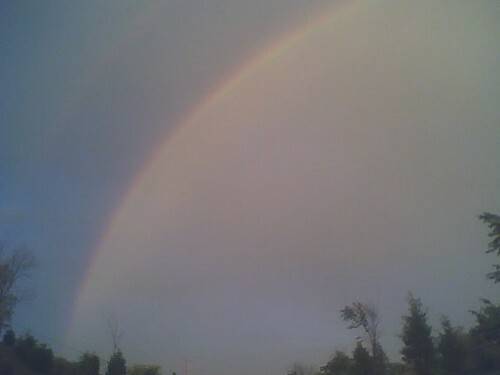 A few minutes later, the colors got gorgeously intense and then another rainbow formed directly over top of it. What gorgeous things have you seen lately? 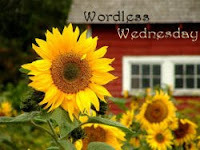 Post your own Wordless Wednesday post and drop the link here in the comments so that we can all see! Tackle It Tuesday - Kittens! Finish It Friday - Beds!